A while back I had qualified through Fusion Cash to take a survey to rate a whole lot of music clips. I had pretty much given up on receiving any sort of payment since the company said back in January that all payments had already been made, but then all of a sudden, I received a $20 check in the mail for the survey just a couple of days ago. It was a nice surprise. Congratulations on the cash out. I have been letting my earnings accumulate since December. I am thinking I will cash out toward the end of either April or May. I am aware of the 180 day cash out rule. My earnings are currently at $89.41. I just completed a Tap Research survey, and I was somewhat disappointed when I completed it entirely only for it to show on the screen that I received 2 cents. However, when I checked my account, I saw that a 37 cent credit had been approved. Has anyone seen this type of payment discrepancy recently? This is the first time I see something like this with Tap Research. Congratulations on getting that many HyperMX videos. I remember I once had something like 30 + HyperMX videos available, but that was a long time ago. I have not had any of these videos available in quite some time. I saw this on my page recently. I attempted to complete the offer, but when I clicked on the offer, it gave be only a white screen. The offer is no longer available on my videos page. While completing the PTC offer the last few days, I get a screen asking me to log in again once I start clicking on the required 4 pages. Once I log in again, everything works correctly. Has anyone had this issue recently? I would get this error before, but I got it when I initially clicked on "Paid to Click." I could not even get to the PTC page unless I logged in again. I just completed a Peanut Labs survey only to click "Finished" at the end and receive a survey unavailable error. I have come to expect occasional glitches with surveys, but it is frustrating nonetheless. I just recently received a payment picture bonus too. 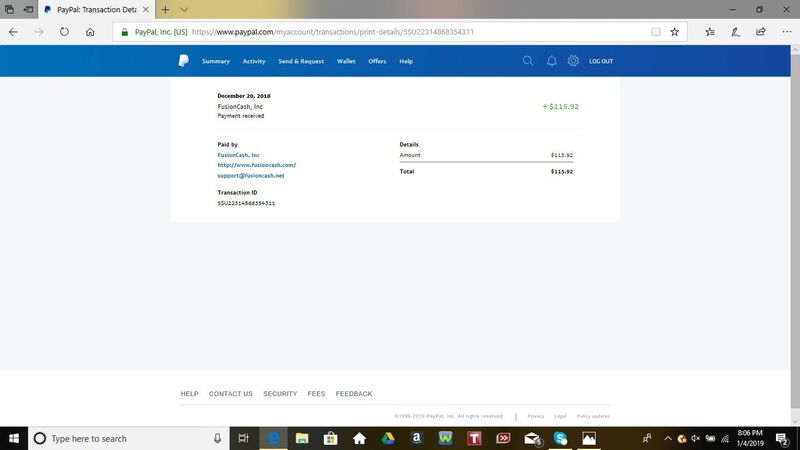 It was also for the payment I received in December 2018. I understand that it was late, but I appreciate it nonetheless. Offers / Re: POLL: What type of offers have you recently done? It is 2, 3, and 4 for me. I usually start with the email in the morning and then come back a little later. I usually start off with the videos section followed by Tap Research, FC Surveys, and finally Peanut Labs surveys. I generally do not attempt 5-8. Payments / Re: I plan to Cash Out toNight! Congratulations on cashing out. It is always a good feeling to know you have a payment coming. I have been letting my earnings accumulate for the last several months, and I am thinking about cashing out at the end of next month. I am currently at $83.79. Let's see how much more I can earn between now and then. Thanks for the end of the month reminder. It is a good idea to get these reminders out just in case one forgets about it. I am able to cash out, but I have been letting my earnings accumulate for a few months, and I think I will wait until next month to cash out. I am on track for the month as far as posts are concerned. I have not seen that offer, but I generally stay away from offers that ask you to download something. Nonetheless, I am glad that the offer worked out for you. It helps that you like the game. I suppose I could consider an offer like this in the future if there is a game that gets my attention. Congratulations on the payment. I have been letting my earnings accumulate for a few months, and I will probably cash out in April. I am looking forward to it. gogeta_god, the moderator sends out an e mail once a new round is open. Each round lasts about 3 days and a few activities are posted each day. You receive a $25 Amazon gift card after each round, so yes $125 plus any bonuses. There is a break of a couple of weeks between each round.